The 250th foundation year of the historic Qila Mubarak has brought in some good news for the admirers of the fort that has been lying in a shambles due to poor maintenance. A three-member team of foreign experts today visited Qila Mubarak, the only fort built by a Sikh ruler. They said though the monument was in a dilapidated state, it could still be saved. 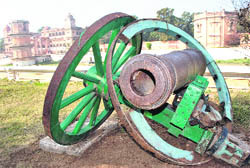 While discussing methods to save the building from further damage, they said an amount of Rs 200 crore (£25m) was required for restoration work. SULTANPUR LODHI: Notwithstanding announcements by Punjab chief minister Parkash Singh Badal and deputy chief minister SukhbirBadal to preserve heritage of the state, construction is going on with impunity along a very old bridge, constructed with Nanakshahi bricks and considered to be around six centuries old, on the old course of historic Kali Bein writes I P Singh in The Times of India. While the local administration seems to have turned a blind eye towards the construction being carried out by a Nihang outfit, it would not only endanger arches of the heritage bridge but would also conceal its visibility. The bridge is situated right behind historic Gurdwara Ber Sahib. In a major embarrassment for the Punjab Government, Justice Ranjit Singh of the Punjab and Haryana High Court has asserted that the State needs to be put on notice to explain why sale of heritage buildings and the land on which these stand be not stopped, writes Saurabh Malik in The Tribune. Taking up a reference in this regard by Justice Ranjit Singh, Chief Justice Arjan Kumar Sikri and Justice Rakesh Kumar Jain today issued notice to the State and other respondents. The notice came after Justice Ranjit Singh took suo motu cognizance of news-reports in these columns on crumbling heritage of Punjab. The State has also been asked to explain whether it intends to demolish century-old Patiala central jail or other heritage buildings in Baradari Garden. The royal city of Patiala has a long list of heritage buildings, most of them more than a century old. But instead of preserving and promoting them among the tourists, the state government has been exploring the commercial aspect: demolishing them and auctioning the land. The Shiromani Gurdwara Prabandhak Committee (SGPC) has decided to prepare a comprehensive plan for the maintenance of Sikh shrines in Pakistan. SGPC chief Avtar Singh Makkar said this after inaugurating the five-day ‘Inspire’ internship camp sponsored by the Department of Science and Technology at Baba Banda Singh Bahadur Engineering College here today. Makkar said the decision had been taken after the recent judgment of the Pakistan Supreme Court fixing responsibility of the government there for the maintenance of religious institutions of the minorities. He said they would present the draft proposal to the Pakistani authorities so that ‘kar sewa’ of Sikh shrines could be taken up as early as possible. He said the SGPC was also ready to provide funds for the repair of the shrines. On July 1, 1590 AD, a board on the main gate of Gurdwara Panjvi Patshahi in Bilga village says, an important marriage party halted in this village located off Phillaur town in Jalandhar district. Having spent two nights in the village and on the request of its residents, the groom left his old clothes and other articles here as he prepared for his wedding.